It makes you feel calm, peaceful, and really comfortable in your sleeping bag. It also, I’m sad to say, really, really makes you want to go to the bathroom, no matter how cold it is outside that sleeping bag. Hey, I never said camping was perfect, did I? Clambering out of our bags in the nearly empty canyon campground (ah, the joy of off-season travel), JaG and I prepared our oatmeal breakfasts and slowly warmed up. I’m not a big oatmeal fan on a day-to-day basis, but when you’re camping, nothing quite sticks to the bones like it does. Well, the addition of a good cup of hot chocolate or tea doesn’t hurt either. 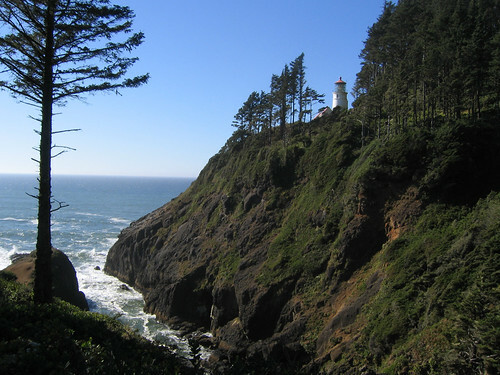 After packing the cars we wandered through the campground and up to the Cape Perpetua Visitor Center. We spent a while perusing the displays on the natural history (including the ever-popular “reach inside the box and guess what disgusting thing you’re holding”) and human history (the area was a CCC camp in the ‘thirties). 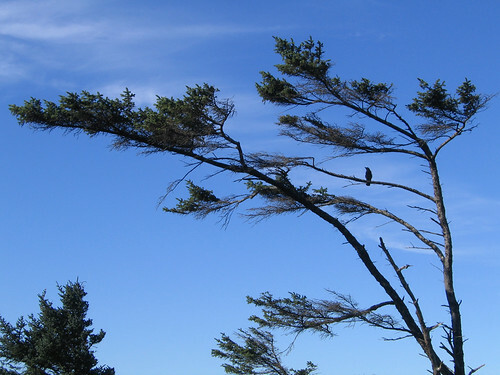 Windblown trees near Cape Perpetua; the crow wouldn’t stop cawing until I took his portrait! I also discovered that JaG is amazing with jigsaw puzzles, and we had to tear ourselves away from finishing the one they had out. Gotta leave something for the kiddies, right? 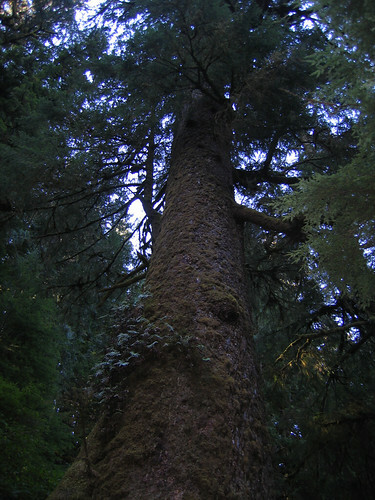 Needing a morning hike, we left the visitor center for the two mile out-and-back to the Giant Spruce Tree. 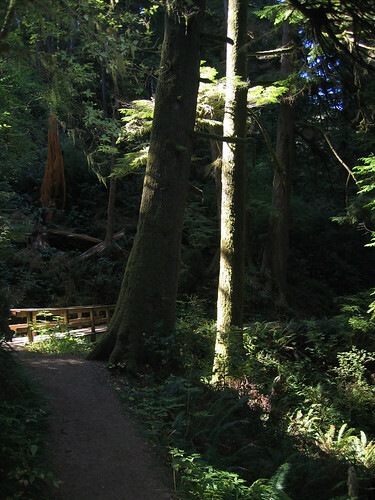 The trail starts either at the visitor center or at various points in the campground and wanders up the canyon to what is apparently the largest spruce tree in Oregon. And, luckily, we made it there, commiserated with the tree, and made it back before the group hike got in. Since it was nearly check-out time by this point, we drove up to the cape itself and took in the views up and down the coast. 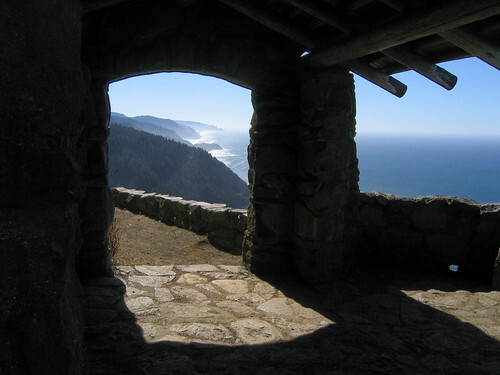 At the end of the cape is a lookout hut built by the CCC back in the thirties. 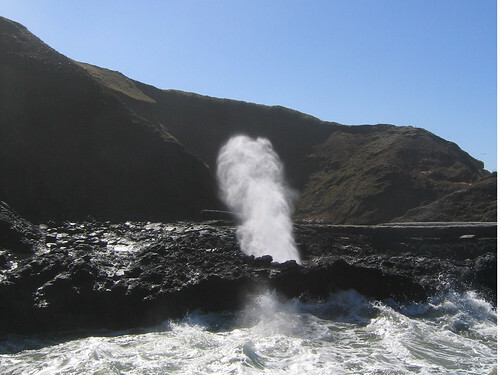 Heading back out to the coast, we made a quick stop at the Spouting Horn, a fountain in the rock through which water shoots vertically at high tide. I attempted, in vain I think, to get a decent picture of it. 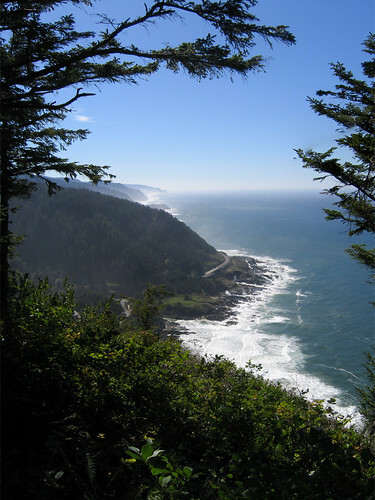 Heading down the coast, we made a couple of beach stops along the way to stretch our legs. 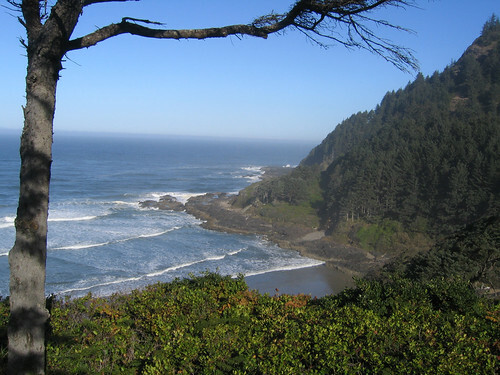 The Oregon coast in undeniably beautiful; with groves of pine trees on the left and the ocean crashing against the shore on the right, it’s amazing I didn’t drive straight off the road. 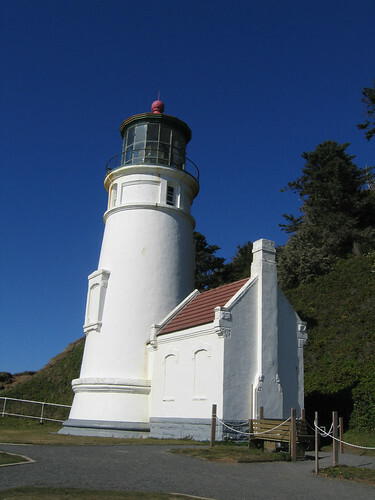 Eventually we ended up at our lunchtime destination: Heceta Head Light Station. Before taking the tour, we had lunch: leftover turkey, apples, cheese, crackers, granola bars. It reminded both of us of lunch stops on car trips during childhood. I remember many lunch stops at rest areas, picnic areas and roadside pullouts: Dad pulling in with the tent-trailer in tow, Mom gabbing a bunch of stuff and whipping together what amounted to a quick picnic. And now I do it too. Cool. Bellies full, we headed up the hill to the Lighthouse itself and took the quick tour. 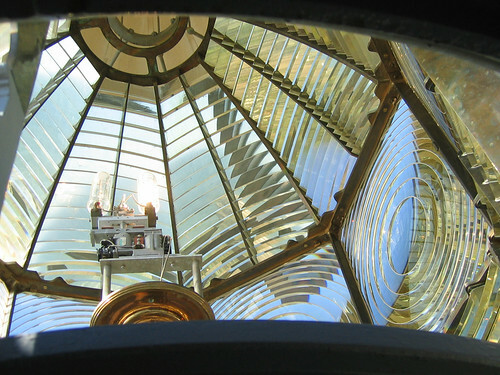 The tour takes you up to the watch room, just below the lantern room, where you can look up and admire the beautiful work of the Fresnel Lens. 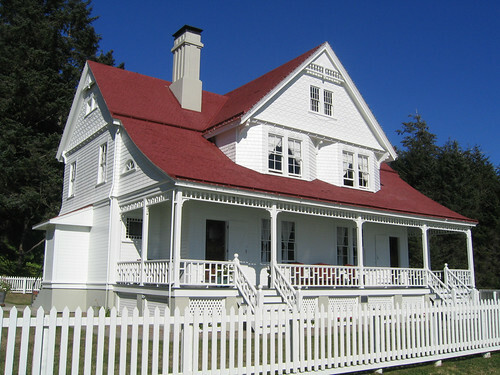 After perusing the gift shop (a must on any road-trip), we passed the old Keepers Cottage (actually a duplex) that is today a Bed and Breakfast. 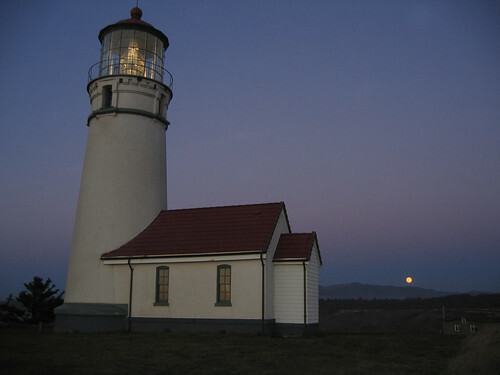 We continued down the road through various small and medium sized towns along the coast (Florence looked like it was just about the right size) until we reached our destination for the evening: Cape Blanco State Park. Unlike the previous evening, the campground here sits out on the end of the cape and is, to put it mildly, a bit breezy. 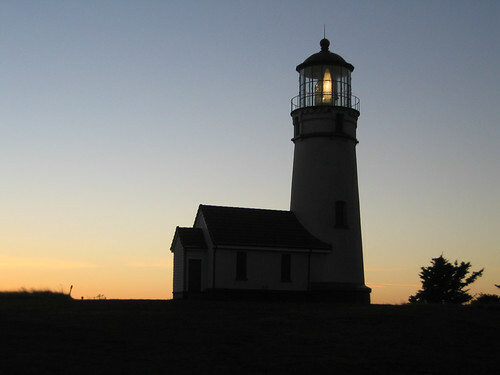 We put up our tents, staked the hell out of them, and made a quick run out to the end of the cape, hoping to see the lighthouse at sunset. As you can tell, we were a bit late, which didn’t stop us from braving the strong winds and heading out to the building to take photographs. Heading back through the gusts to camp, we built what is probably the largest fire I’ve ever made for only two people and huddled next to it, grilling our hot dogs. Finally, around 9:00, the wind died off, making the evening much more pleasant. Wow, those are awesome pics!! But, where are pics of you and JaG????? dabegil – thanks for the compliment. No, both JaG and I are quite shy, and managed to avoid being in front of the camera for pretty much the whole trip! Puzzle? Did someone mention a puzzle?